Davey Lopes shows techniques to (from left) Chris Roberson, coach Jerry Martin and Greg Golson. CLEARWATER, Fla. - Davey Lopes couldn't believe his ears. Phillies prospect Greg Golson told him yesterday that, if he got caught stealing, he wouldn't try to steal a base for three or four games. "What?" Lopes asked the fastest of the Phillies congregated around him at second base. "So, what if you strike out, you don't get a hit? You go three, four games without trying to get another hit?" "That put it in perspective," Golson said. "That won't be the case this year. I'm going to be aggressive." That is the crux of Lopes' lessons: aggression, fueled by arrogance. It is why he was hired to replace Marc Bombard as first-base coach. Long after the regulars retired for the day, Lopes stayed on Mike Schmidt Field with Jimmy Rollins, Shane Victorino, Michael Bourn, Chris Roberson and Golson. They worked on technique. They talked about attitude. "You can't have fear. You have fear, you're dead," said Lopes, who stole 557 bases in his 16 big-league seasons, 25th all-time. "Certain basestealers have an attitude to the point of being cocky. The guys who, everybody in the ballpark knows they're stealing. The pitcher. The catcher. The manager. Even the fans." Rollins has 207 stolen bases in six seasons, but has never stolen 50 bases, cracking 40 only twice. Lopes has said Rollins could steal 50 without a problem. This season, Victorino is expected to be a full-time starter in the majors for the first time. He's likely to be the fastest player to make the 25-man roster but, despite stealing more than 40 bases twice in the minors, he has only 11 steals in 210 major league games. He hasn't stolen more than 23 bases in a single year since 2003. "It's confidence, I think, that I've lost," Victorino said. "Getting me back to that swagger where I say, 'I'm going. Right here.' There's a lot of big expectations for me this year. I'm going to get it back, right here, in spring training." Bourn's confidence has never been in question. Slated for Triple A, the 24-year-old snagged 45 bases in the minors last season, his fourth straight productive year as a thief. He appreciated Lopes' lessons - and his teaching style. "If you have success doing it your way, he'll leave you alone," Bourn said. Roberson, taller and lankier than most good basestealers, has shown decent basestealing potential. Golson, however, has only 67 steals in 269 Class A games after being taken in the first round of the 2004 draft. The Phillies hope Bourn and Golson will constitute a devilishly fast outfield for them one day. Bourn, Golson and Roberson worked with Lopes after practice Wednesday, too. Yesterday, Rollins and Victorino joined the advanced lessons. 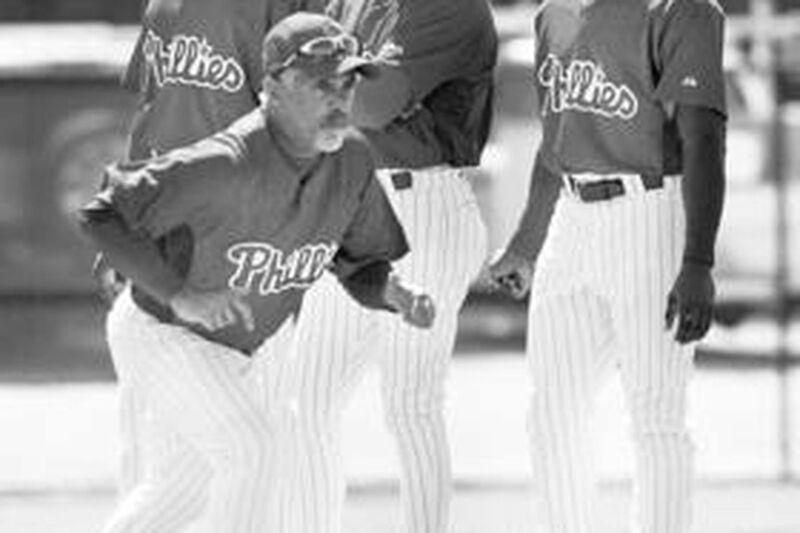 First, Lopes worked on smoothing the players' mechanics for stealing third, concentrating on them keeping their feet on the ground as they shuffled away and maintaining balance throughout. Then they moved to first base, where Lopes noticed that Golson's crossover step led him toward the pitcher's mound instead of toward second base. The reason: Golson spent years running track, a discipline that requires that a sprinter's head stay down as he gains speed. When a player's head comes up and looks at the base, Lopes explained, that first step goes toward the bag. Golson looked at his tracks. "He was right," Golson said. That lost fraction of a second might explain why Golson has been successful in only 76 percent of his stolen-base attempts (Bourn, by contrast, is at 85 percent). A poor percent is bound to decrease confidence. That, Lopes cannot abide. "You can't do it if you don't have it," Lopes said. "All the great ones have it. Rickey [Henderson]. [Vince] Coleman. [Lou] Brock. Maury Wills. Willie Wilson. Ron LeFlore. I'm leaving some out, but they had it." Do the Phillies have it? "The physical tools are there," Lopes said. "I'll have to see how they play this year. They can say anything. It's their actions that will tell me differently." Golson, a nonroster invitee who will probably top out at Double A this year, isn't likely to have much of an impact at the major league level, so Lopes can only observe him from afar. That doesn't mean Golson can't learn while he's around Lopes. After Wednesday's session, Golson, 21, logged on to the Internet and discovered that Lopes, 61, had done most of his damage before Golson was born.